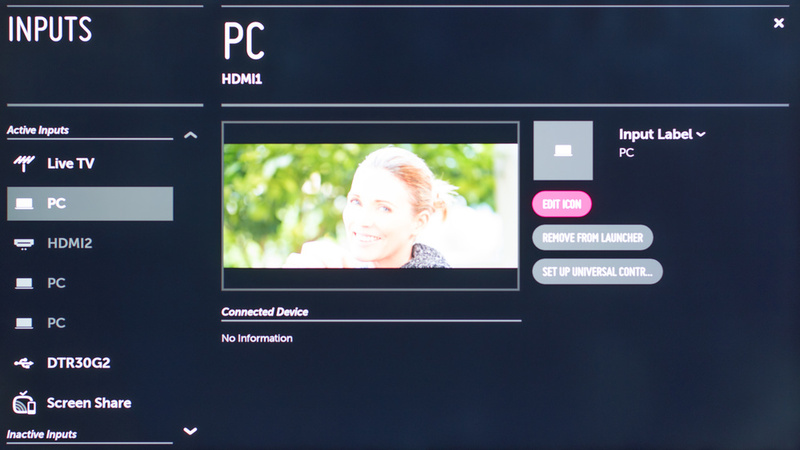 The following are the calibration settings we used to review the LG 65" E7P (65SJ9500). These work well with everything except for gaming which requires a few extra changes, listed below. First, we turn off the 'Energy Saving' since we do not want to screen brightness to change depending on the room lighting. 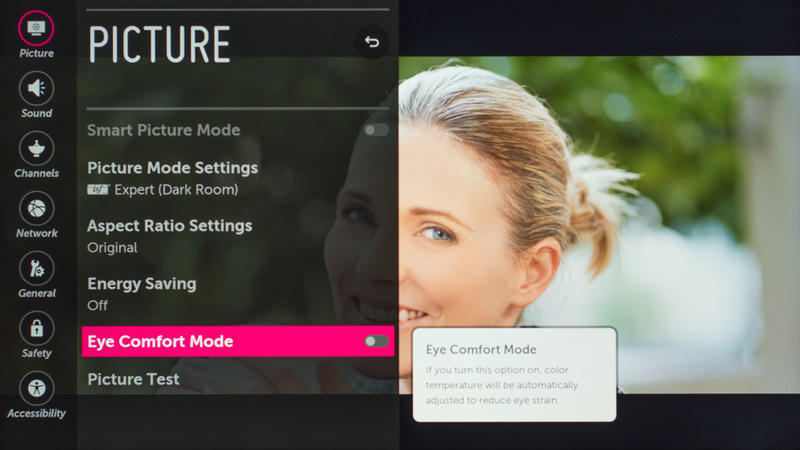 We turn off the 'Eye Comfort Mode' since we do not want the TV to change the color temperature automatically depending on the content. We then selected the 'IFS Expert (Dark Room)' picture mode since it was the picture mode that was the closest to our calibration goal. For calibration purposes, we adjusted 'Backlight' to 22 to reach our desired luminance of 100 cd/m². You can change the 'Backlight' to match your room environment. For a brighter room, this will need to be increased. Not that this does not affect the colors, only the luminance of the display. We then set the 'Contrast' to 100 and left the 'Brightness' to 50, its default values. We adjusted both the 'H Sharpness' and the 'V Sharpness' to 0 because we did not want to add any sharpening. 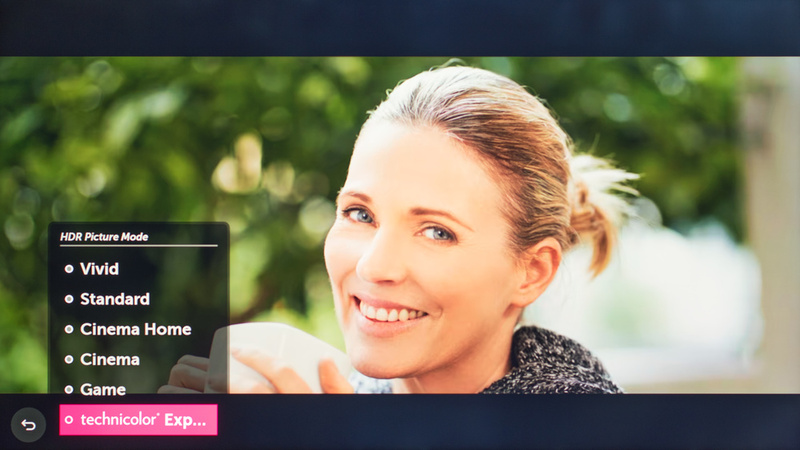 'Color' was left to 50 and 'Tint' to 0, both their default values. In the 'Expert Controls' settings page, we turned off 'Dynamic contrast', 'Super Resolution', 'Edge Enhancer' and 'Color Filter' as most of those are extra image processing and not needed if you want to keep the content as true to what the content creator wanted. 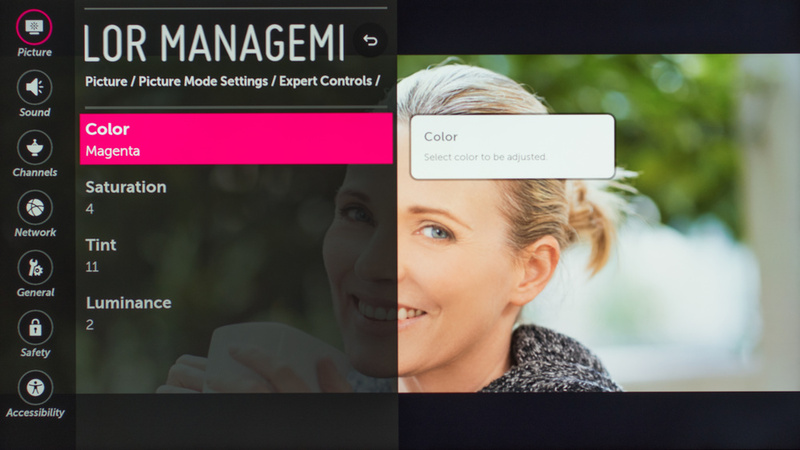 We set the 'Color Gamut' to 'Auto' since when set to 'Auto', the TV will change the 'Color Gamut' automatically to match the source. For our calibration process, we set the 'Gamma' to 2.2 as it helped to reach our calibration goal, but if you find that the blacks are crushed in some video content, you can use a lower gamma setting or if you find that the TV is clipping in the white (losing detail in the white regions), you can use a higher gamma setting. *Note that if you do not intend to calibrate the SJ9500, you can use the 'Out of the box setting mention in the 'Pre-Calibration' section, as those were the most accurate for this TV. In the 'Picture Options' menu, we turned off 'Noise Reduction' and 'MPEG Noise Reduction', but you can turn on these features a different level if you are watching older low-resolution content, as it may help reduce visual noise and compression artifacts. We set the 'Black Level' to 'Low' to match our source 'Output Dynamic Range'. We left 'Motion Eye Care' turned off since we did not want the TV to change the brightness of the TV automatically depending on the displayed scene. The 'LED Local Dimming' option was left turned off for the calibration process, but this could be turned on for normal use. 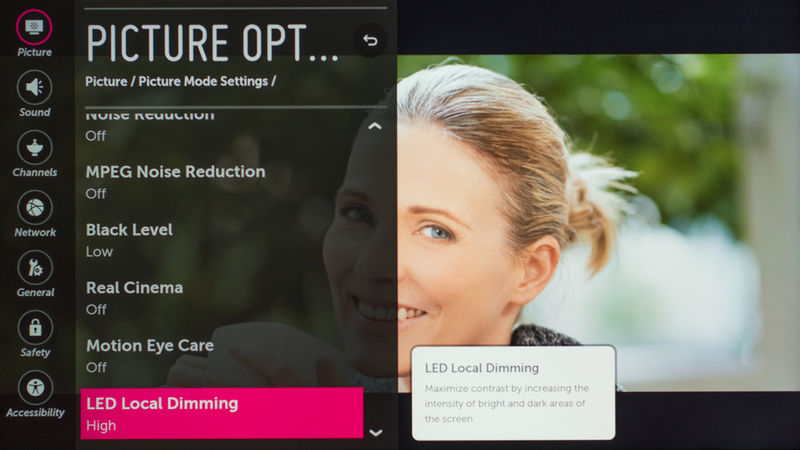 You can refer to the 'Local Dimming' section to know more about this feature and the best setting for normal use. For the 'Real Cinema' and 'TruMotion' settings, these relate to the 24p playback and motion interpolation (soap opera effect) you can read here to know more about those options. 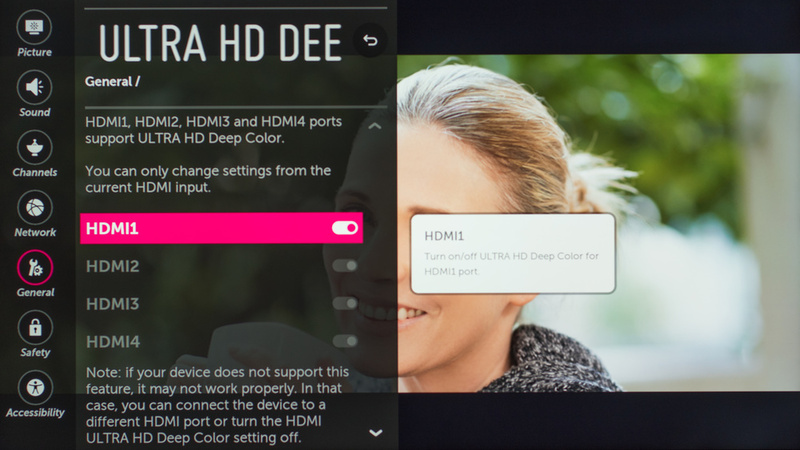 First thing to do is to turn on 'HDMI ULTRA HD Deep Color' for the HDMI port where you intend to connect your HDR UHD Blu-ray players (or video games console if you are using it as a Blu-ray player), as some external device may not detect that the TV can support the full HDMI bandwidth necessary for HDR content. When the TV detects HDR content, it will give you 6 'HDR Picture Mode' options. For movies, the 'technicolor Expert Mode' picture mode is the best option available since it will give you more control of the settings, similar to what you have access with 'IFS Expert (Dark Room)' with SDR content and it is also brighter than the other mode. 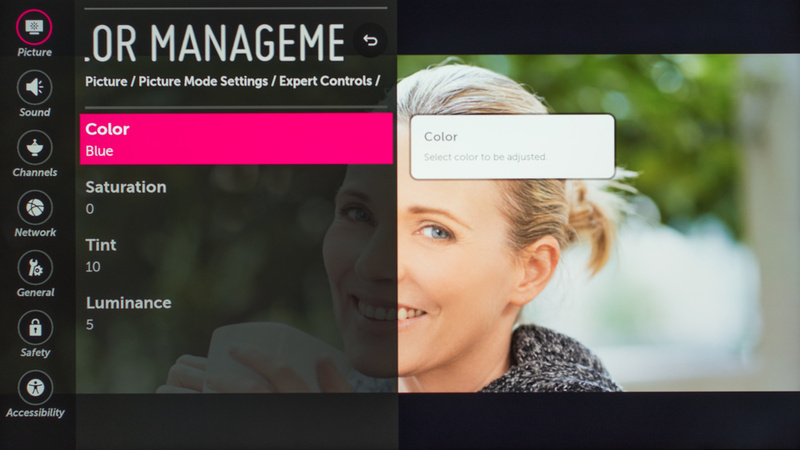 When using the HDR 'technicolor Expert Mode' picture mode, the most accurate color temperature is 'Warm2'. The 2017 LG TVs now support HDR with 'Active HDR', which is similar to HDR10+ or HDR10 with dynamic metadata. 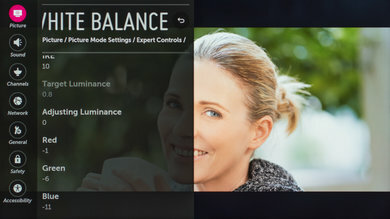 This feature analyses the content frame by frame in real time to adjust the HDR tone mapping curve. This has the advantage of displaying each scene with an optimized HDR effect, as opposed to the HDR with a static metadata, where the movie was using the same tone mapping curve, resulting in some scene sometimes being too dark or too bright or simply not exposed correctly to have the best possible HDR effect. To activate, you need to go in the 'Expert control' tab. In the 'Expert Control' tab, you will need to set the 'Dynamic Contrast' to 'Low'. The low setting turn on the 'Active HDR without the 'Contrast Enhancement. We usually don't like to add any unnecessary image processing and this is why we are proposing to use the 'Low' setting here, as the 'Contrast Enhancement' would modify the content in a way that was not intended by the content creator. If you want to test this extra feature, then the 'Medium' setting set the 'Contrast Enhancement' to Low and the 'High' to 'High'. Note that 'Active HDR' does not work when the TV is in 'Game' 'HDR Picture Mode' or in 'PC' Mode, so we recommend setting the 'Dynamic Contrast' 'Off' under those conditions. To get the best input lag possible when gaming, you need to set the 'Picture Mode' to 'Game'. Once the 'Game' picture mode is selected, some options won't be available in the setting pages since the 'Game' picture mode disables most of the image processing to give better input lag. Under game mode, the color temperature setting is now a slider giving you a different control from colder to warmer and 'W30' should give you a similar setting to what 'Warm2' would normally give you outside game mode. The gamma selection is also a bit different, giving you the option from 'Low' to 'High2'. In both cases, adjust these to your preference. For the rest of the available settings, you can follow our general settings. For HDR gaming, simply turn on 'HDMI ULTRA HD Deep Color' for the HDMI port where you intend to connect your video game console or PC and select the 'Game' 'HDR picture Mode' to have the best input lag possible. 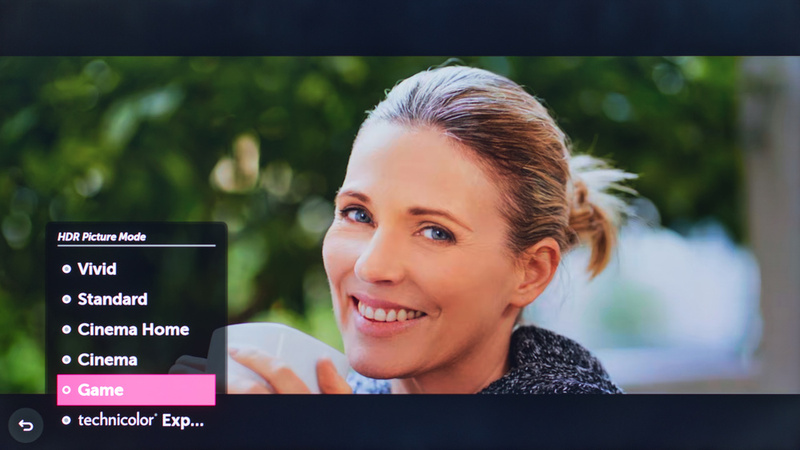 If you want to activate the Chroma subsampling (4:4:4), you need to set the 'Input Label' to 'PC' for the HDMI port where your device is connected. This setting is available via the 'Input' menu.